It’s pretty amazing to me how many paddle options there are now. Along with the stock paddles, I’ve been tinkering with shapes and sizes I like. Here’s what I have currently. I also have some Leleo Kinimaka wood paddles but those are with other people currently. C4 Waterman full carbon 9.5″ blade and 48″ length for knee paddling. I haven’t given this the full try yet. I just cut it to length the other day. (Custom by me) Diamond “E” cut C4 Waterman 2 pc paddle cut from an 8.5″ blade. Fiberglass blade and carbon shaft. The 2 pieces of shaft on the right of the paddle are for adjusting the length. This is what my 5 year old can use and I also use it to paddle on my knees or sitting. (Custom by me) C4 Waterman 75″ long fiberglass blade, carbon shaft Diamond “E” cut paddle. This is great for surfing as it doesn’t throw you off balance. (Custom by me) C4 Waterman 72″ wood shaft Diamond “E” Fiberglass blade paddle. This is for women to use or shorter guys. (Custom by me) Kialoa full carbon Shaka Pu’u prototype that I cut down from 8.75″ to 7.75″ at the widest area. I know you’re thinking I’m a wimp for shaving down all my blades but I prefer to call it ‘finesse’. 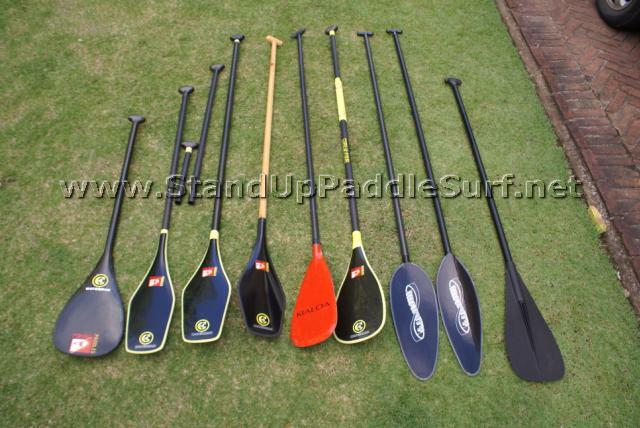 Stock C4 Waterman 8.5″ full carbon paddle with C4 paddle grip. Infinity Surf Ottertail 83″ long full carbon 7″ surf blade paddle. Great for adjusting the power needed by stroke depth and easier on the joints. Infinity Surf Ottertail 84″ long epoxy 6.5″ narrow surf blade paddle. More flex in the shaft than full carbon. Aluminum shaft and plastic blade paddle from Go Bananas. This is for people I don’t trust to touch my other paddles…just kidding. I got it a long time ago. You really feel you can adjust your power with those Infinity paddles like it states on the website? I heard someone else make the same statement. Just sounds like a repeat from the website. I had the 7″ and it just didn’t seem like it had the power to do much. Not enough paddle area to move my 220lbs. Someone told me with the smaller blade you get less tired. I found it to be the opposite. Took too much power to make the board go. Hard to keep those paddles going straight without too much flutter. Yup, I do. I just used that paddle last weekend in a downwind run. I don’t have any flutter problem and I’m also 220 lbs. I did notice this recently. I cut a c4 paddle blade to be a cross btw the Infinity and the C4. It works great and that’s what I normally use. I use my narrow width cut blade for any board 10′ and over because it just seems to work better for me and is easier on my shoulders but once I started riding an 8′9″ board the paddle didn’t give enough power in the stroke to move me so I started using the 8.5″ blade and that feels perfect. Paddles are like cars, all personal preference. I think I prefer a certain amount of resistance and that’s what I’m using as a gauge. Maybe that’s why I like the 8.5″ blade for the smaller board. This entry is filed under Gear Previews, Paddles. You can follow any responses to this entry through RSS 2.0. You can skip to the end and leave a response. Pinging is currently not allowed.